The Panzerbike. A monster bike like no other. The Frankenstein of all motorcycles. This big boy has an 800-horsepower engine, and weighs in at 4.74 tons. 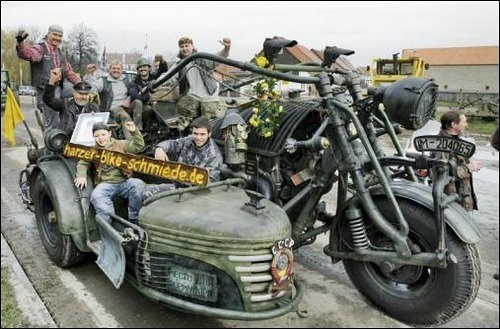 Harzer Bike built the colossal WWII German motorbike with sidecar using a slew of materials, including the bonnet from a Soviet truck and the engine from a diesel T-55 tank. Although nicknamed the "Panzerbike," Panzer tanks were actually German-made and the T-55 was Soviet-made.